Hello, this is just a quick review for all those interested. And immediately set about buying them and running with them. Initially, there were things that I had to do that were... unusual for me. You'll notice that these shoes are at the UK Amazon site. This is because Nike does not ship them out here in the US. In fact, Amazon was about the only reliable company I could find to ship these out here across the pond. That said, I had no way of testing them before buying, or for that matter sizing them. I had to measure my foot and estimate, hoping for the best. The shoes I ended up with were a little larger than I think they should have been, I think a half a size smaller would have been better but so be it. Because they are split-toe, I think having a tighter fit may be a grass-is-greener situation: I can imagine it would be better for functionality and transparency, but would probably create more toe-wedgies (more on that later). On occasion, if I clip my toe on something or land a cat leap a little off, my foot will slip out of the top of the shoe. I think this has more to due with the half-size off difference than the shoe itself. The shoe itself is made out of a sort of tough jersey material, and the bottom of the shoe has two sort of 'channels' that separate the ball of the foot from everything else. If you land on a rail right on the ball of the foot, curling your toes around it is remarkably easy. It behaves like your barefoot would, no doubt. That said, there really is no give in the arch of the foot down to the heel. The first few runs took some getting used to, but I'm happy with them now that I've adapted. Obscenely lightweight. The shoe is mostly that jersey fabric and lycra, the only thing that weighs anything is the sole. Really, it's like wearing nothing at all. Depends greatly on the surface. Some things it grips like glue (metal, bark, wood, gravel, concrete, rocks, carpet), other things it lags on (anything wet, especially wet granite, drywall, and painted brick... though it does really well on painted metal, for whatever reason). I haven't had any trouble with a lack of grip, really. I have had trouble with too much grip, but I'll get into that a little later. The waffle texture on the soles is beginning to wear down, but the grip isn't wearing down any. 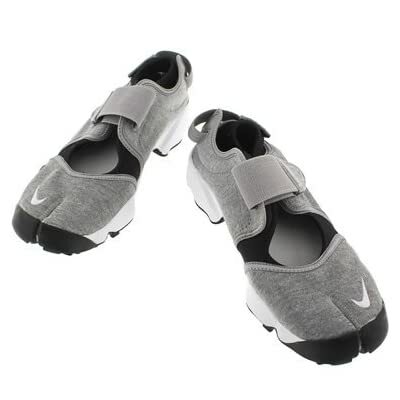 The Air Rift has an open top, and also allows some air to pass through the split-toe. There is fabric inside the split, but it's a light lycra and breathes well. They also have a heel strap, so there is open air passing through that hole also, though it's obviously less apparent. Since the MTR series is made of that heavy jersey, it breathes really well. Leather might be a little less airy. Again, this shoe is supposed to be like running in bare feet. Due to this, the cushioning is almost non-existent. But, that said, the arch is well supported. I also noticed that the shoe quickly picked up my foot contours and the stock padding became like a tough second skin. About that. The shoe itself has held up quite well so far, and I've been using it consistently almost every day for the past 6 months. The tip of the shoe is starting to wear because of some failed wallruns, scraping the front fabric against concrete (or, in a few instances, grip tape). The split toe on the right shoe developed a hole at the crease that got larger - so much so that it worried me that it would split the entire shoe in half. I put some super glue on it and it's held up well, despite looking permanently stained. The leather models of the Rift might not be prone to these sorts of holes. The rubber on the bottom is starting to wear on the inside ball of the foot, but it has so much rubber that I doubt it'll matter much in the long run. All-in-all, I'd say these suckers will probably last a year of moderate use. Expensive as hell, all things considered. After conversion to US dollars and shipping, the shoes alone were about $150. Then, because they are split-toe, I had to buy socks. The only socks I found around here were the Injinji toe socks, about $14 a pair. The socks are comfortable and unique, but not really worth $14 each. Also, I couldn't take the stock padding for distance drops, so I installed a sports insole. I think it ran about $20. Expensive shoes, definitely. Toe wedgies. The socks I had to buy for these were made of a sort of nylon, but the padding on the inside of the shoe is designed for grip. Also, the rubber itself is designed for grip. Therefore, the socks have a habit of moving on their own accord inside the shoe. The wedgie gets annoying. I also had to install an extra insole for padding which worked OK until the blue fabric on the outside fell out. Underneath that was a sort of spongy rubbery padding that tends to stick to everything. It's bad for toe wedgie, but it's good for grip sake. All in all, I'm rather happy with the shoe, even through the mods and concessions I had to make. I wish they were more inexpensive, but I plan to hold on to this shoe until it utterly disintegrates. It is by far the most comfortable shoe I've ever worn, and I believe that running in something this close to barefoot has improved my technique significantly. If you're looking for an all-around trainer, seriously consider the Air Rift. It is a unique and quality shoe, remarkably well suited for parkour. I hope this has been a good guide! Let me know if you have any specific questions. How well does that main velcro strap over the top of the foot hold up? Does it ever come undone? Your obstacle is my shortcut. Thanks a bunch for writing a review! Added to the list. I don't know if these are the exact same model, but they are much cheaper than 150$. Plus Zappos has free shipping. Mike - np man, anything I can do to help! Brandan - Yep, certainly more expensive than I anticipated. The velcro is super secure - it's sort of like a micro velcro. I have yet to even see it fray or become loose at all. Math - they look about right, but womens sizes only? If you did the conversion, it might work. They actually have cheaper ones on on Amazon also, but the ones in the link I provided were the only confirmed men's size shoe I found. I'd also like to add that at the Colorado jam today, climbing up a mountain, I did not feel any slip or lack of grip on the rock face at all. They held up really well! Ah, did not see that, lol. You don't have to buy Injinji toe socks. Just wear a regular pair of socks and fold the material in between your big toe and the other toes. Trust me it works and you wont even notice it. none of the links are working for me. any one else having that problem? It would certainly seem like they're becoming harder and harder to find. When I looked for mine, the MTR II's were the only ones I could find available for U.S. shipping. It looks like Finish Line may have some available, so you can check here: (http://www.finishline.com/store/product/nike-air-rift-mens-casual-shoe/_/A-18319?productId=prod669989). As a small follow-up review - I trained with these bad boys for about a year before I made the switch to VFFs. I had intended to do so when I was used to the idea of barefoot running, and these were a nice stepping stone to move from traditional, heavily-padded shoes to practically nothing. I am pleasantly surprised to announce that they held up quite well, considering the amount of use I got from them and the total shoe decimation that comes with parkour. The tread on the bottom is completely gone around the ball of the foot, but the rubber is still holding strong and never developed a hole. That's more than I can say for the stitching around the split-toe itself, which developed a tear leading to a hole within the first 6-8 months and required repair stitching to keep the shoe in-tact. I did also have to apply some superglue around the intersection of the split-toe, as that developed a pretty nasty hole as well. Finally, while the heel-strap velcro on the back of the shoe held up quite well, the repeated opening and closing of the velcro on the top of the shoe caused the velcro to fail and I had to have a snap button installed to prevent the shoe from flying off in nearly any circumstance. I really am still quite impressed by this shoe - Nike truly put together an interesting and long-lasting product. I still use them when I need to go outside and am too lazy to put socks on, and I will probably keep them for some time (indeed, as I stated a year and a half ago, I will keep this shoe until it disintegrates ). Same here, I found this thread in Google as I'm looking for shoes like this for parkour. Are there any other shoes like this nowadays for less than $150?